Developer John Wise stands in front of his latest Chattanooga project to open in the 1800 block of Chestnut Street. City leaders are putting together a new zoning package for the future that is based on form, instead of traditional use standards. 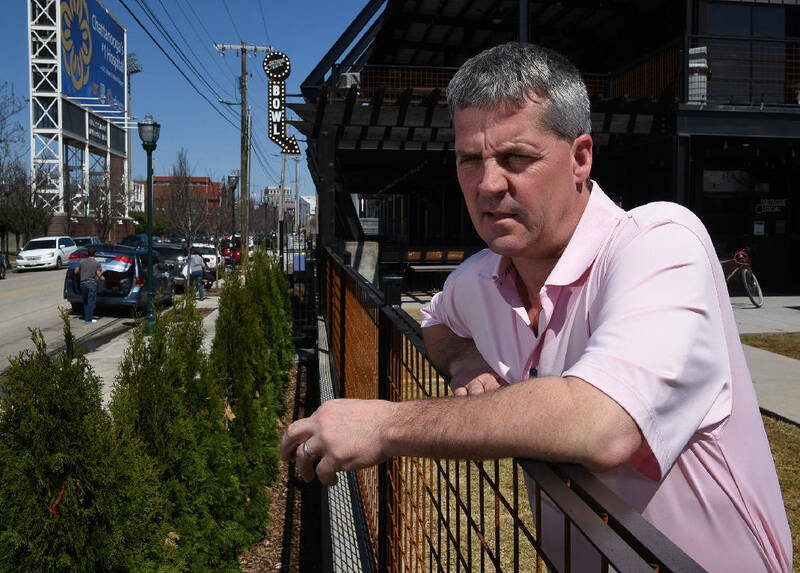 Five downtown Chattanooga neighborhoods will look and feel different if the property code changes proposed by city leaders and urban planners are approved later this year. The North Shore, Riverfront, City Center, M.L. King and Southside neighborhoods are tabbed to be the first in the city governed by new zoning laws focused on introducing trees along the street, wider sidewalks and more sidewalk -- as opposed to parking lot -- access to buildings. The new model is called form-based zoning, and is centered squarely on how humans interact with the city. "Form-based codes are people-centric," said Chattanooga Mayor Andy Berke. "Citizens have told me since Day 1 that our city has real needs when it comes to zoning and building codes." The new codes are a major shift from the decades-old, current way of regulating property. Instead of solely focusing on a property's residential, commercial or industrial designation, form-based codes add a level of aesthetics by taking the surrounding area's character into account. The proposed codes would impact some of Chattanooga's trendiest and neighborhoods, as well as the tourist district and the new innovation district. The move comes as many cities across the country search for a way to breathe life back into their downtown areas, after years of focusing on suburban areas and neglecting urban upkeep. Lynn Richards, president and CEO at Congress for the New Urbanism, said this type of zoning is a national trend and one not hard to understand when you imagine your favorite street in your own town. Her group, based in D.C., serves as a consultant and champion for walkable neighborhoods. Form-based zoning encourages people-friendly development by introducing wider sidewalks, trees along streets and streetfront entry to buildings in urban neighborhoods. It also removes space between buildings and streets, framing streets instead of having large surface parking lots in front of buildings. The city, Hamilton County, the Regional Planning Agency and a third-party consulting firm out of Austin, Texas are working together to overhaul building zoning codes for essentially all of downtown Chattanooga. Existing zoning codes are based on property use. The city is moving toward form-based coding, which focuses instead on aesthetics, and aims to create more predictable and organized streetscapes, very similar to what the Brainerd Overlay Project seeks to achieve. The new zoning will have a monumental impact on the way Chattanooga looks going forward and create all-new regulations for builders and developers doing new construction and repurposing in the city. "I'm guessing that the one reason why you like that street so much ... is that as a pedestrian, when you're walking down that street, you feel safe," she said. Richards said buildings that come up to the sidewalk and frame the street, have on-street parking and trees out front make pedestrians feel safer -- and generally better -- about a place. "That is, it matters less whether or not there is a dentist in those stores, or a bookstore, or a coffee shop, or even residences that abut," she said, "but what makes that street work is the form and the context of the buildings as they relate to the street." It's that kind of street experience that members of a Chattanooga Forward task force told Berke citizens are craving in Chattanooga. Berke endorsed the pursuit of new property codes for parts of downtown, and the city has been working with the Regional Planning Agency and Austin, Texas-based consulting firm Code Studio since February. Implementing the new codes in certain parts of downtown is also expected to set zoning precedents for other parts of the city not yet included. And not only are form-based zoning regulations seen as a way to bring life back into dead and ugly parts of town, planners hope the new codes make it easier for builders. Many developers complain now that it's too expensive and too time-consuming to go through the city engineering and urban planning process when trying to build in Chattanooga. Start to finish, it takes about three months. And it still promises no result when a proposed project goes before the public for a vote, even though the developer has also had to expend a great deal of money to get to that point. "Working your way back from that adversarial model is definitely part of the intent," said Lee Eisenweiler, principal at Code Studio. He said under form-based zoning, "the developer actually gets the choices." "It puts a new spin on the development community and theoretically makes them [developers] the implementer of your development plan," he said. John Wise, founder and president of Wise Properties, is behind several recent downtown constructions, including the new up-and-coming mixed-use building at the intersection of Main and Market streets. He is in favor of the new regulations. Urban planners say the new codes won't make it any more costly to build downtown, though it's not immediately clear whether the city or private developers will have to pay for the called-for improvements such as adding trees into a property's design. But Wise said it would be worth the extra costs even if it falls on builders. He said having clear expectations and standards, if enforced equally, will protect developers from investing millions only to have a shoddy-looking warehouse, for example, put up down the street, thus draining surrounding property values. "What developers want is a level playing field," said Wise. "They don't mind spending more money, as long as everybody has to spend more money." The new codes are still being developed locally and will come for their first official vote this fall.